Stopping in front of the 【Fortona】 Adventurer’s Guild, I check its exterior. It’s a building which conforms with the dark brown wooden architecture around here. Its size is approximately the same as the guild which was in 【Holkerbaum】, I think. Its entrance is a wooden double door like those in western movies. I push open the door, which has remains of dirt caused by countless adventurers on it, and enter. Right after going inside, I discover sideways a room where it’s possible to hold meetings. The interior isn’t spacious but neither is it narrow. A crystal magic light source is installed on the ceiling and illuminates the adventurer’s guild’s interior brightly. The floor was made out of wood and there was a crowd in front of the board where the requests have been posted as usual. As for races, there are only human adventurers… beastmen are a minority, huh? Blending into the large number of humans, I look at the request papers which were posted. There should be a request for subjugating the snake dragon… oh, found it immediately. The request for the Snake Dragon Hesp. It’s written on a large, high-grade-looking parchment. It seems to be an emergency request and invites those at B rank, A rank or above. Subjugation Proof: The snake dragon’s fangs, the snake dragon’s venom and the snake dragon’s egg. Usually it’s those three, but since spring water will flow out of the temple’s statue if you defeat Snake Dragon Hesp, it’s not particularly required this time. Suggestions: It bites with venomous saliva, blows one away with its trunk, performs ramming attacks and has thorns at the tail, those are what requires special attention. Remarks: Adventurers above B rank are encouraged to participate. However, since it’s an emergency request, you won’t be asked about your rank. By the way, the snake dragon’s fangs, the snake dragon’s venom and the snake dragon’s egg are items that can be sold for a high price. Grabbing a wooden token which had the request number written on it, I take it to a receptionist. Isn’t it great that one of the receptionists is a beautiful child. Though there’s only a small number of receptionists. Among them there was a pretty child. It has bright, light brown hair and light brown pupils. Only at the spot of this receptionist a queue has formed. But, well… I can understand it. Only her hairdo is stylish, too. The white flower decoration close to her ear suited her. She’s a beauty matching a flower. However, to even expressly line up there, well. There’s a muscular guy with a shaved head, an old person with a skinny face, and a plain woman. Well, isn’t that fine? Let’s go to the plain child this time. Rather than the skin-headed, muscular male receptionist, she’s a woman. Ignoring the line at the idol receptionist, I walk briskly. I came in front of the plain receptionist. I present the wooden token with the request’s number written on it and my guild card. The receptionist brings out the usual silver plate with a crystal ball attached to it. However, the way she holds it is awkward. This receptionist, is she a newcomer? Finally she placed the silver plate on the reception table. The crystal shines when I place my hand on it. It was accepted right away. The receptionist picks up the card and confirms it by bringing her face close to the card with all her might. Does she have a tendency to squint or does she have a bad eyesight, I wonder…? While twitching her eyebrows, she bows with a force and grandiosely hits the desk as she returned the card. At that point I bid farewell to the plain receptionist who adds the expression “desu” to the end of her sentences. I headed towards the parlour. Rollo purrs shortly with a quiet, throaty voice. It seems it’s sleeping time for her while buried inside the hood. Well then, apart from entering the parlour, will I hunt together with the clans? I don’t want to be constricted in my actions overly much, but… it might be fine to slip into the group until we are in the middle of it. Someone will probably know the exact place of Snake Dragon Hesp’s location. While thinking about such convenient matters, I push the handle of the room’s door and go inside. They were in some kind of strategy meeting. I sat down on a free chair and joined the meeting. After those leader-like men talked, a woman stood up to appeal. The leading man talked while turning his look at the other participants. I get lured into it as well and check the surroundings. The ones raising their hand are— none. A representative of the other clan says so. The vanguards, including me, participating individually are 8 people. There are 2 archers for the rear guard and a single magician. 【Fortona’s Light】 has 4 vanguards. 2 archers for the rearguard and two magicians. 【Golden Sword King】 has 4 vanguards and two magicians as rearguards. By the way, I raised my hand as vanguard. It seems to be about me. After that there’s no obvious objection. Since there’s one magician who can use lightning magic which is the snake dragon’s weak-point, the archers will spread out and shoot their arrows while she hits the dragon with lightning. During that time, the vanguards will rush in. After causing damage, they will retreat right away. With that timing, the lightning attack will be repeated twice. We will carry out the hunt in such pattern. It was decided in such manner. Will it go that nicely and conveniently? Although I wondered about that, I stayed silent. Once the meeting ends, I head towards the 【Goddess Forest】 together with those adventurers. Everyone walks. There’s no one riding a horse. Is it because we will enter a woodland, I wonder? I immediately understood the problem once we entered 【Goddess Forest】. The ground of this woodland has a lot of uneven, complicated terrain. The rotten bushes on the ground and such probably obstruct the movement of forms of transport such as magic beasts and horses. Therefore everyone advanced on foot. In my case I can move swiftly by walking among the trees, but this time it’s a group action. All of the adventurers proceed while staying organized. Once we enter the forest, monster groups such as goblins and human-shaped hedgehogs appear, but the adventurers, including me, easily defeat those monster groups. We continue walking in the Goddess Forest while killing monsters. And then a blue lake surface became visible from in-between the forest’s trees. The adventurer group stops there. Then the leading adventurer pointed towards a different woodland at the other side of the lake. He gives instructions as our target is over there. When I look at the indicated place, I could see that the idol is definitely there. A big serpent is coiled around the idol. I see. That’s Snake Dragon Hesp, eh? It’s certainly a large snake. I understand why a dragon has been attached to its name. The idol is a huge statue which has a height of 10 meters and a width of several metres. It wrapped its long, thick trunk around the idol as if eating the statue. Seeing the coiled-around appearance of the snake dragon from here, it’s mysterious since it also looks like an objet d’art. In the vicinity of that idol there is a great number of what can be believed to be the snake dragon’s eggs. The lightning magic of the female magician, who is clad in a purple robe and is the fuse of the strategy, began. Numerous strikes of lightning hit the area around Snake Dragon Hesp’s back. The snake dragon somersaults and topples over, falling off the statue. It seems to be indeed the snake dragon’s weak-point. The snake dragon convulses and goes numb. The adventurers raise a cheer at that sight and release fireball and fire arrow spells one after the other. The archers shot their arrows as well. Although the fireballs hit the snake dragon’s scales directly and cause an explosion, the snake dragon is mostly unhurt. However, the arrows pierce the scales and stick in its body. It seems to be going considerably easily. After that the fighters in the vanguard rush in right away. While pondering about that question, I materialize the Magic Spear in my hand. Rollo descends to the ground from my shoulder and increases her size with a billowing. Well, as I’m an individual participant, I will have them let me act freely. If it’s a snake, it’s the head, I guess. I will crush the head first. Taking Rollo along, we separate from the vanguard group. The snake dragon’s trunk is long, thick and is covered with blue scales. The vanguards started to attack that trunk. A single, large-built warrior forcefully strikes his hammer on the long, thick trunk causing it to shake. It’s an incredible, heavy-looking blow. Destroying the scales with one mighty blow, which might be considered to be a skill, blood and torn pieces of blue flesh fly into the surroundings from within. Next the attacks from the other vanguards began. They destroy the scales with hammers, cut the flesh with swords, and stab spears inside. Driving in the spears which were lost after being stuck inside the flesh, with hammers, they completely embed them into the deep wounds. At that time— at the end of the snake dragon’s long trunk, a loud roar resounds from the direction where the head’s located. It seems to have been fairly effective. Screams of pain can be heard as well. Did the vanguard group, who heard the roars, get carried away? Without separating from the trunk, they stacked up additional attacks. Huh? Ain’t that the timing for the lightning attack? What the hell did they do at the strategy meeting? That was a boasting speech of fellow clans after all… they wasted my time. Without saying anything to the vanguards, I head towards Snake Dragon Hesp’s head. Did the snake dragon get mad? It swiftly reacted by wriggling its huge trunk. Uwa— the vanguards were caught by a wave of the trunk which made a sound of *don*. Almost all vanguards have been trapped under the large trunk as if being swallowed inside it and are getting crushed to death. There are some survivors, but the follow-up spells are a drop in the bucket. Seeing that, screams can be heard from the rear. O~i. What about additional lightning magic? Even though it will be fine if you shoot it while also dragging the vanguard into it, the retreat is far too quick, isn’t it? Oh well, having ignored the strategy from the beginning, what can I say about it though. Rollo gave me a proper answer even while following at my side. We dash while aiming for Hesp’s head. Snake Dragon Hesp constricted its trunk, expanded its tail and stretched it. Countless long thorns grow from the swollen tail and are launched high into the sky one after the other as if a mortar’s shooting. The number of thick thorns reaches up to several tens of hundreds. Pouring down atop the people, who were retreating, like a large rain of needles, the magicians were pierced and skewered one after the other. Is the agility of the adventurers using bows high? As they survived the large needle attack by successfully dodging it, they escape while showing their backs. At that point I could see the snake dragon’s head. A pair of purplish red pupils with vertical slits. The both sides of the head are bulging like an elephant’s ears. You could even say it transformed sideways into a vast and huge cobra head. I send my lookeye contact towards Rollo who is running next to me. Meeting my gaze, Rollo separates to the side without saying anything. I stand directly in front of the snake dragon. Was it attracted by my voice? I don’t know, but Snake Dragon Hesp opened its mouth wide while releasing a snake-like sound. Two long fangs are growing from its mouth. A poisonous-looking liquid trickled down from the tip of the fangs. Going by the appearance, I go into a state of MAX alertness. I swiftly avoid that poison spit with Magic Combat Step. At the place where I was previously standing, a venomous violet smoke rose up from the ground while giving off a heterogeneous, disgusting sound as if being chemically changed by acid with a *shuaaa*. I definitely understand that it’s “poison” as an intense sulphur stench hangs in the air as well. Once I stop moving even for a bit, it spits poison once again. Employing Magic Step, I freely use footwork as if performing repetitive side leaps with a nice rhythm and avoid the approaching poison spit attack. The snake dragon turned towards me, who keeps dodging swiftly, shook its head frantically to scatter the spit and continued to spew venom. I continue to avoid the poison spit, but— the stench. The poison spit came flying once again— I avoid it. It’s a stench at the level of burning your throat. At that timing the snake dragon’s movement stops and it didn’t spit any poison. Oh, did she do it? Rollo climbed on the head of Snake Dragon Hesp. Directly biting the head of Hesp, she is stabbing her tentacle bone swords all over with warped movements. 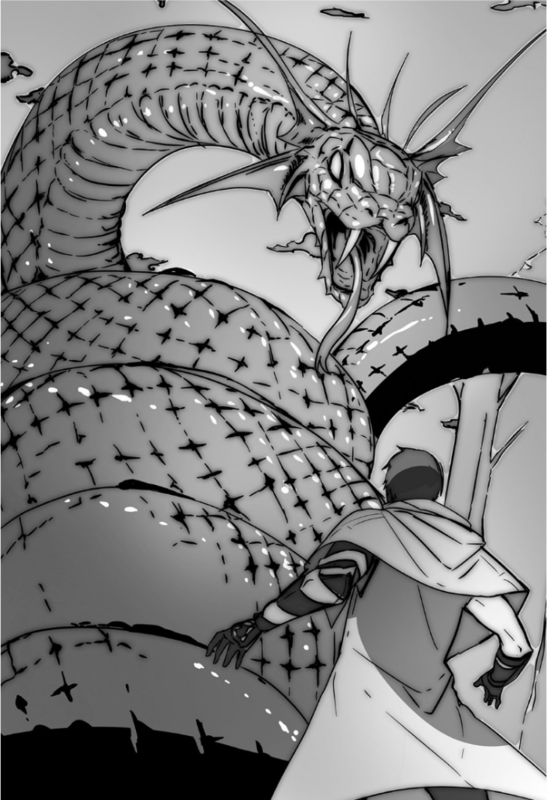 The snake dragon seems to be confused by receiving an unexpected attack. — I rush at the enemy in front while avoiding the decaying ground which is generating an offensive smell due to the venom. Hesp moves its purplish red eyes desperately up and down and wriggles its trunk. Rollo bites as if eating the flesh while clinging to the trembling head of the snake dragon and at the same time tearing into the scaly skin with her limb’s claws. Bluish purple blood gushed vigorously forth from the head of the injured snake dragon. Going by the state of that injury, it doesn’t just seem like she’s eating it, but she’s actually really eating, I guess. Thanks to that, the snake dragon has completely lost its awareness of me. While running, I extend left hand out towards Snake Dragon Hesp and fire a <Chain>. The chain advanced swiftly through the air and pierced into the cobra-like head of Snake Dragon Hesp. I understand from the sensation directly transmitted by the <Chain FactorTatoo Mark> at the left wrist that the chain’s pointed endPure Drop is penetrating inside while tearing up Snake Dragon Hesp’s flesh and bones. I continued to move the chain in order to penetrate Hesp’s head. As is, it will even directly destroy the brain, but I will personally beat the daylights out of it. I glare at it and make the chain contract with my left hand while setting up the magic spear. Just like that my body was transported towards the snake dragon’s head. Becoming gigantic in my field of vision, the snake dragon’s head occupies all of it. I invoke <Darkness Drill> and put it on the magic spear I’m grasping in only the right hand with the force of clashing into the head which has that impressiveness. The red spear of the magic spear spiral clad in darkness pierced an eyeball of Snake Dragon Hesp. Then Rollo’s tentacle bone sword stabs into the back of the snake dragon’s head. The snake dragon quivers as if having become numb including its trunk and its movements grew dull. While watching that, I land diagonally on the snake dragon’s head with both feet. I jump lightly while treating the chain like a rappelling rope for the act of descending off buildings. I pull out the magic spear, which was embedded in the eyeball, at that time. The bloodstained, huge eyeball stuck to the red spear, but without minding that, I pushed out the magic spear with enough power to sew the eyeball to the middle of the snake dragon’s forehead. The magic spear pierces the middle of the snake dragon’s forehead. The crushed eyeball makes it feel like a certain work of artmodern art. However— not yet. Supported by the chain, I jump once again. Next I pull out the magic spear with <Darkness Drill – Magic Spear Break>. The intense thrusting technique of the red spearmagic spear spiralling with the <Darkness Drill> clad in darkness breaks through the eye socket while destroying the remaining brocade-coloured eyeball. And, without even taking a split second, Demolition Spear Grand Pulse appears. With a force surpassing the pushed out magic spear, Demolition Spear Grand PulseHuge Lance of Darkness spirals towards the enemy while while raising a hum. It invades the snake dragon’s head as if breaking through soft tofu. It’s the darkness lance which once opened a wind hole even in the Magic Dragon King. While making a strange noise similar to being dragged into a fiendish mixer drill, the snake dragon’s head’s meat is sent flying into the surroundings. Without the spiral rotations of Demolition Spear Grand Pulse weakening, it broke through the back of the head after enveloping the upper skull’s surface of Snake Dragon Hesp in a maelstrom and going through it by hollowing it out. A part of gooey brain mass droops out from the cross-section of the head which was pierced through in the shape of an ellipse, and Snake Dragon Hesp stops moving with a slump and then collapses to the side it inclined on. With the darkness lance having gouged out more than half of the head, it naturally disappeared after Demolition Spear Grand Pulse broke through into mid-air on the other side. The four-layered thrust in combination with the skill went well. As it’s to the bitter end a consecutive hitting, it has a difficult timing though. Rollo is stabbing her tentacle bone swords into the long trunk of the snake dragon which is still convulsing, but Snake Dragon Hesp’s cramps gradually weaken and it stops moving. I hurry towards the head of Snake Dragon Hesp. Trying to recover its fangs, I also collect its venom. Even if I collect this poison, a regular jar will apparently melt. What to do… shall I dismantle and examine it? I cut up the head into round slices towards the throat. Once I investigate the venom gland continuing from the small hole at the tip of a fang, what connects to the source ahead of it is… oh, found it after all. I have discovered the poison bag. It was contained between the bones inside the throat. It will be fine if I recover it directly. There’s plenty of sickening poison, like a blend of purple and green, in the poison bag. Making an incision by using an Dagger of the Ancient Dragon at the source, I succeed at cutting out the fangs and poison bag. … I retrieve the poison bag carefully to not spill anything. Tying the end of the bag, I sealed it by melting that bound end with the red axe blade. Extracting the snake dragon’s fangs from the root, I cut off the fangs, which are tightly sticking into the bone, with the Dagger of the Ancient Dragon. I finished the rough collection. Shall I return while retrieving the snake dragon’s eggs at the end? Following the trunk from the snake dragon’s head, I store the snake dragon’s eggs in my item box while on the way of returning. And then I returned to the site where the vanguards fought. The surviving adventurers are… just two. They are sitting down on the ground. A largely-built man and a normal-sized man looked at me and asked that. The largely-built man, who has a wound on his forehead, opens his eyes widely in surprise due to my words. Ah, this person was the leader at the meeting. It seems that he doesn’t remember my name. Shall I introduce myself for the time being? That rain-like, large needle attack, eh? Once Saji praises me, the man next to him opens his mouth as well. The person who was a leader-like existence at the meeting, huh? Since he survived, he’s probably considerably powerful. Saji stands up unsteadily, picks up his favourite weapon, places it on his shoulder and leaves while dragging his feet a bit. The leader of 【Golden Sword King】 looked at the corpses of his friends and talked while looking sad. There are still things I have to do. I spend my time by recovering the eggs which were in visible range. At the time when I tried to go back after finishing the retrieval, evening had passed and it had already turned into night. Let’s use the trees growing in 【Goddess Forest】 for the return in the dark night. Using <Chain> and <Magic Hand guided by Thought>, I move along the trees. Like that I was able to swiftly return to the guild. Once I enter inside the guild, the looks immediately focus on me. It seems the rumours of the Snake Dragon Hesp subjugation have already spread. Since the rumour is that I did it by myself… it’s a seed of troubles, but well, I don’t care. I don’t have any intention to stay here for long. Throwing out my chest, I boldly walk towards the reception. I took out the fangs, venom and eggs, which are the proof that I defeated Snake Dragon Hesp, and my card from my item box for the plain receptionist, who was in charge of me in the beginning, and placed it on top of the reception table with a *thump*. The beautiful receptionist glared at the plain receptionist, who is working briskly in the back of the office as I’m waiting, with a warped mouth. How scary. The white flower close to her ear seems to wither in an instant. Did she notice that I’m looking strangely at her state? The glaring, beautiful receptionist fixes her expression right away and returns a pleasant smile to me. Ye~a, I might have ended up seeing the human relations in this workplace. However, it’s not like I can do anything either though. Plain receptionist, do your best, is what I secretly murmur in my mind. When I did that, the receptionist came back. Huh? The design of the gold coins, which I always looked at, is distinctly different from what I remember. Ah~, because the country is different, huh…? Shall I try asking about that aspect? I take out one gold coin from my item box. I see, if they have the same value, there’s no necessity to exchange them. It seems to circulate here even though the country, which is beyond the desert, is quite far away. However, why is the value of gold coins of different countries uniform? There might be some agreement between the countries, I guess? At the time when I paid money in the inn, I also used Oseberia’s currency. Well, it can’t be helped even if I, who is no more than a single adventurer, ponders about such troublesome matters. While agreeing, I put the received reward into my item box and take the card. I looked at the adventurer’s card. The number of completed requests is 12. The completion number is growing well. If I remember correctly, I can’t take the B rank ascension trial if I don’t complete 30 with the exception of pioneering missions in unexplored areas. Once I completed 30 someday, I will try asking. I put away the card into my chest pocket. Well then, shall I go to the temple? It would be great if the spring water has come back. Need to kill giant sanke. Forming an instant raid party was never good idea. From a raid battlle to being a solo battle..
What i like about this MC is him let everybody do their job and let them die doing their best, in many isekai the MC’s protect everybody and defeat everything and make the others just useless who admire mc and never do nothing more. Instead here we have them grieving death of friends and learning. I feel this MC more human and this world more alive than other isekai.